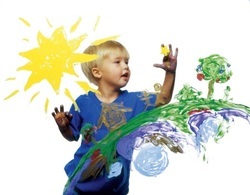 Children can learn up to SEVEN languages up to the age of 9! It is important to give our children a chance to learn languages as early in life as possible because this is when they have the greatest ability to do so. Learning a language increases a child's all-round intellectual development, by learning these sounds at an early age, allows parts of the brain to develop which are otherwise underutilized. This enhanced ability stays with children for life. By contrast we lose this ability if we don't use it early enough and this is why it is harder to learn new languages as we get older. "Children can learn up to seven languages up to the age of 9"
Kids have an amazing ability to absorb any language without conscious effort. They pick up vocabulary, structure, pronunciation and intonation as means of effective communication, rather than as a structure to be memorised. The advantage of Ene Due Rabe is that children will be put in a social setting where they are immersed in the language of the native speaker teacher through experiencing day to day activities and topics within the class setting.For many kids, Ene Due Rabe will provide a circle of friends in their native language as well as the opportunity to retain and develop their native language and culture as they grow. Bringing kids up in two cultures enriches their lives but they need regular exposure to both. On the other hand some kids coming to Ene Due Rabe will have little or no previous knowledge of the language they want to learn. We will form small groups for kids with same or similar interests. The Ene Due Rabe experience is only possible because of our team of teachers who are native speakers form around the world. They share their languages and unique talents as well as creating an atmosphere of their countries, bringing all these exciting countries to life in the classroom. STARTING: 21st of SEPTEMBER 2013! 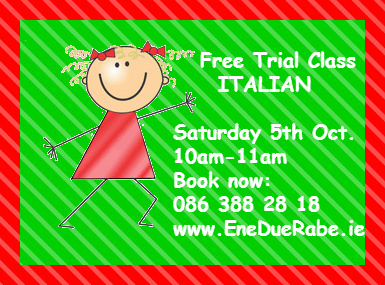 If you have missed 5th of Oct. you can still come and get a free trial on the 12th of Oct.
Don't miss our FREE trial classes in French and Italian:If you have missed 5th of Oct. you can still come and get a free trial on the 12th of Oct.
Ene Due Rabe is a new language school providing kids aged 3 to 12 with an environment conducive to learning in a fun and exciting way. Learning languages will be based around undertaking fun activities which will stimulate their absorption of the language. 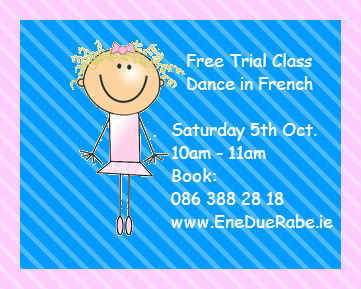 Ene Due Rabe will provide a platform for kids to learn and practice their language skills while having fun and interacting with other kids. We will provide classes for both beginners and native speakers. At the moment we have expressions of interest in Spanish, German, French, Chinese, Italian, Polish, Croatian, and other languages. In this way they will have the opportunity to apply their language skills with other kids in a fun and interactive way. They will realise the importance of developing and applying their language skills in social situations.